It shouldn´t, but regarding economic policy you never know! Maybe others ‘root against’ because it would show how they failed! Japan’s rising inflation, as measured by consumer prices, may reduce the likelihood of immediate additional monetary easing steps by the Bank of Japan. The core CPI, the central bank’s preferred price gauge, rose 1.3% in December, beating economists’ expectations for a second straight month. Core CPI strips out volatile fresh-food prices from the index. Although the figure is still below the central bank’s 2% inflation target, it marked the fastest rise in over five years. 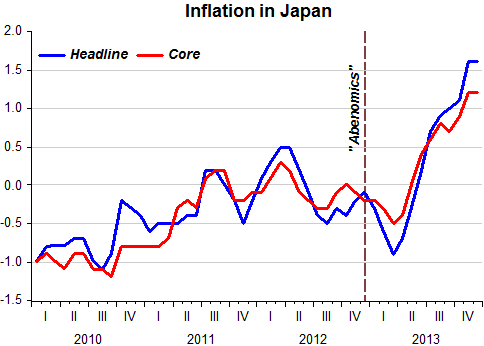 It was also the same rate as the BOJ’s annual price forecast for the fiscal year starting April. I have no idea why Mr. Noguchi “found reason to change his mind”. I hope Abe and Kuroda don´t! Given the deterioration in the external environment, I would think the BoJ should be ever more ‘vigilant’ on the attainment of its targets. 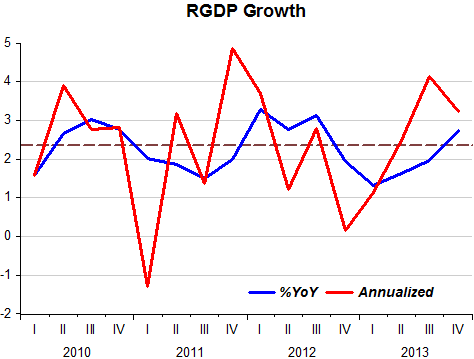 Japan’s current economic recovery is different from any other period of expansion in recent years. Why? Because it’s being led by domestic demand. Economists say that in the past, the world’s third-largest economy expanded when demand for Japanese products abroad grew, encouraging companies to produce more. That in turns lifted the overall economy, benefiting consumers. Lars has written a post that puts Australian monetary policy in a favorable light. I have long thought Australia was the best ‘poster’ for market monetarists, having long ago done a detailed comparison between Australia and New Zealand, a nice ‘laboratory experiment’. The panel below is a good indication that trying to avoid crashes in nominal spending (NGDP) makes the economy much ‘healthier’! Funny thing is that what the Fed sees as no tightening is evolving into a global tightening now as central banks rush to raise rates. Consequently, money surges into the global safe asset – US Treasuries. And, interestingly, I think that you can argue that this is much, much more disconcerting than last year’s taper tantrum. This seems to me to be a pretty clear global disinflationary shock. And it isn’t like inflation was on a runaway train to begin with. Information received since the Federal Open Market Committee met in December indicates that growth in economic activity picked up in recent quarters. The Committee expects that, with appropriate policy accommodation, economic activity will expand at a moderate pace and the unemployment rate will gradually decline toward levels the Committee judges consistent with its dual mandate. If incoming information broadly supports the Committee’s expectation of ongoing improvement in labor market conditions and inflation moving back toward its longer-run objective, the Committee will likely reduce the pace of asset purchases in further measured steps at future meetings. To the Fed it seems that the word “broadly” defines something as wide as the Pacific Ocean! The fact is the economy seems to be in a situation in which “plus ça change, plus ça reste le même”! Over the last four years, real output (RGDP) has grown at the paltry rate of 2.3% (far from enough to bring RGDP back to anywhere near the ‘centenary trend’). 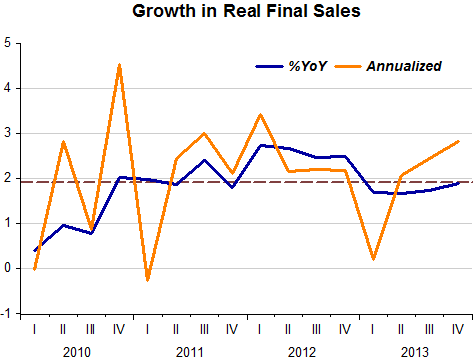 If you take out inventory accumulation and consider Real Final Sales of Domestic Product, growth is even weaker, 1.9%. Notice that in the last four years nothing has changed, i.e. there´s no incipient trend forming that could lead the FOMC to conclude that “growth in economic activity has picked up”. With each new data point it seems that Bernanke´s ‘legacy’ will be having introduced a ‘unit root’ in the RGDP series. 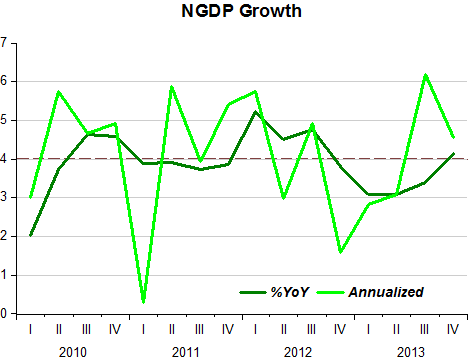 With regards to NGDP, growth in the last four years has averaged 4%. After dropping through the floor in 2008-09, NGDP has been growing quite a bit below the 5.5% observed during the 20 years of the “Great Moderation”. 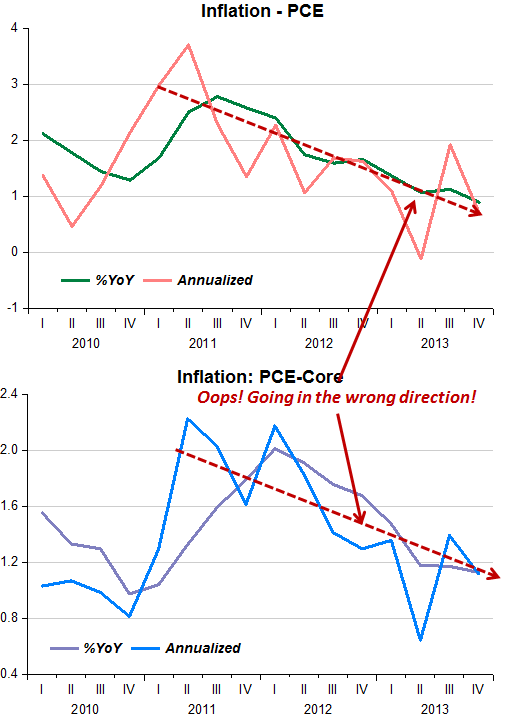 And I really don´t have a clue as to what sort of “monitoring” the Fed is doing on inflation because it has been moving in the “wrong direction” for the past three years! The Bureau of Economic Analysis announced today that U.S. real GDP grew at a 3.2% annual rate in the fourh quarter. That’s two quarters in a row now of above average growth. Given recent experience, that sounds pretty good. What this misses is the fact that we are in a depression (albeit not “great”). To get a recession within a depression blunders committed in 1937 (by the Fed hiking required reserves and by the Treasury sterilizing gold inflows) would have to be repeated! In other words JH is satisfied with the “new normal”! “Forward Guidance” can easily lead you astray! Best practices in central banking call for transparency in policy deliberations and communicating the outcome in a timely manner. Over the past two decades, the FOMC has gone from being quite secretive in its deliberations to very transparent. As the committee has had to deal with the worst financial crisis since the Great Depression and exhausted conventional options, unconventional monetary policy has played a greater role. And within the class of unconventional monetary policies, forward guidance— that is, communication about the likely future course of policy conditional on economic developments—has taken on more importance. This move to increased transparency has been integral in helping the FOMC fulfill its mandate. I wonder if the highlighted sentence above is true. Not only is policy conditionality state dependent, but it is also wrapped in time dependency (when they say, for example, that rates will remain low long after some threshold has been reached). This makes for a confusing recipe. Mark Carney, for example, has had to do a lot of “tongue twisting” about “evolving” forward guidance! The Fed will come to that point soon. Forward guidance shares the basic economic logic that links today’s decisions to future expectations, but it differs in its subject. Forward guidance focuses on the instruments of monetary policy rather than the targets of monetary policy. Market Monetarists suggestion is to ditch the inflation target (which has been put on hold anyway) and adopt an NGDP level target. If it was widely expected (the FOMC decision), why did markets fall significantly on the news? Maybe the markets were expecting some consideration (concern) regarding emerging markets turmoil. But that was solemnly ignored. The Fed’s step back from bond-buying has stoked worries about the stability of emerging markets in recent sessions. Investors say the U.S. central bank’s aggressive program, aimed at stimulating the U.S. economy, pushed investors to send cash to developing economies—taking on more risk in search of greater returns. Worries about the stability of emerging markets flared again Wednesday after interest-rate increases from central banks in Turkey and South Africa didn’t stem a selloff in emerging-market currencies, stocks and debt. Both the Fed and the Bank of England are accordingly now subject to much criticism for having delivered forward guidance that they were subsequently unable to stick to. Some of these attacks are unfair. No one should want the central bank to slavishly follow statements made in the past if circumstances have changed in an unexpected way. Any fair critic must acknowledge that the ubiquitous demand for transparency with respect to the central bank’s plans (phrased simply) inevitably conflicts with the reality that the future is unpredictable, in particular with respect to such developments as unexpected fluctuations in the labor force participation rate. Aware of the uncertainty, the monetary authorities have always hedged their foreign guidance: nobody is now violating a past promise. Are the critics then being entirely unfair? Not entirely. There was another way. A year or two ago, many of us were suggesting that the monetary authorities could announce a target or threshold for Nominal GDP, instead of for inflation, real income, unemployment, or other alternatives. Some of us explicitly warned that a threshold phrased in terms of the unemployment rate would be vulnerable to extraneous fluctuations such as workers exiting the work force, and argued that a nominal GDP threshold would be more robust with respect to such unforecastable developments. This is yet another instance of a long-standing point: if central banks are to focus attention on a single variable, the choice of Nominal GDP is more robust than the leading alternatives. A target or threshold is a far more useful way of communicating plans if one is unlikely to have to violate it or explain it away later. 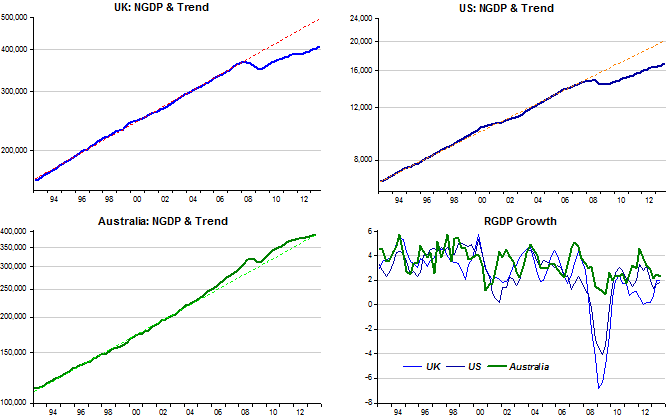 Will Bernanke´s legacy be having introduced a “unit root” in US RGDP? This paper investigates whether macroeconomic time series are better characterized as stationary fluctuations around a deterministic or as non-stationary processes that have no tendency to return to a deterministic path. 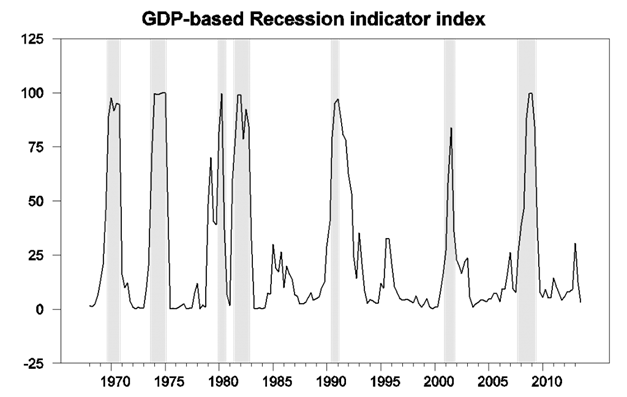 Using long historical time series for the U.S. we are unable to reject the hypothesis that these series are non-stationary stochastic processes with no tendency to return to a trend. Based on these findings and an unobserved components model for output that decomposes fluctuations into a secular or growth component and a cyclical component we infer that shocks to the former, which we associate with real disturbances, contribute substantially to the variation in observed output. We conclude that macroeconomic models that focus on monetary disturbances as a source of purely transitory fluctuations may never be successful in explaining a large fraction of output variation and that stochastic variation due to real factors is an essential element of any model of macroeconomic fluctuations. Subsequent research showed that the hypothesis was ‘heroic’, at least for US real output. The picture that comes out of the chart below seems consistent with RGDP being ‘trend-stationary’, a case in which fluctuations are transitory. The “potential” (mean) growth for the whole period (1870 – 2012) is 3.4%. The next chart shows the same thing based on quarterly post war data. 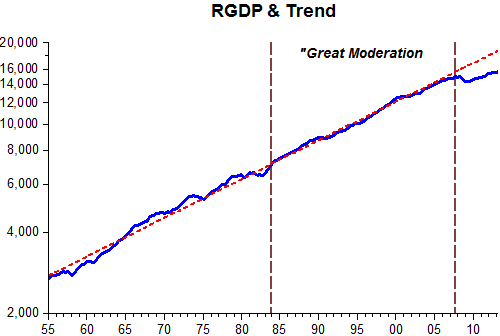 The mean growth is also 3.4%.The “Great Moderation” is visible, being characterized by real output remaining very close to trend for more than 20 years. The point of this post is to wonder if the monetary policy adopted by the Fed after 2007, in reaction to a real shock (oil prices) at the same time that the financial system was ‘wounded’ by the house price crash, has caused a break in the time series of US RGDP. 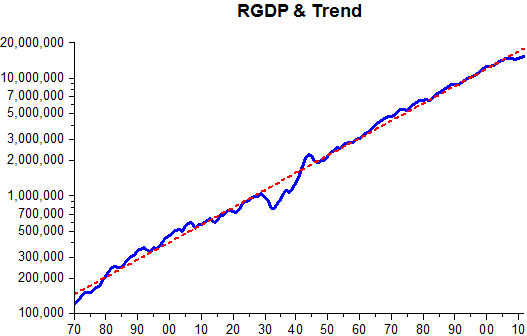 This comes from noticing that more than 6 years since the recession began RGDP shows no “intention” of climbing back to its ‘centenary trend’. Notice from the first chart above that in the fourth year following the start of the “Great Depression” RGDP changed course (‘instigated’ by Roosevelt´s monetary expansion). The ‘break’ view is reflected in the “new normal” that many people talk about. Will it be the case that in 50 years’ time economics students will be shown the “Bernanke Break”? May 13 (2009) (Bloomberg) — The Federal Reserve may soon need to raise interest rates, said John Taylor, the former Treasury official who devised the “Taylor Rule,” a formula for rate- setting based on the outlook for inflation and growth. “My calculation implies we may not have as much time before the Fed has to remove excess reserves and raise the rate,” Taylor, a Treasury undersecretary under President George W. Bush from 2001 to 2005, said yesterday at an Atlanta Fed conference in Jekyll Island, Georgia. If I looked into the ball and saw 0.25% fed funds rates in 2011, I would have a sickening feeling—like I’d been punched in the solar plexus. Krugman would be right, we’d be another Japan. In contrast a 3.75% fed funds rate would put a big smile on my face, as it would indicate nominal GDP growth had bounced back strongly. It would have been a V-shaped recovery. In my view, promising year after year of near zero rates is like promising year after year of sub-par nominal growth. The central bank should adopt a policy that is expected to produce a quick recovery from recession, not years more of economic misery. A policy that is successful will result in much higher nominal interest rate in the future. Five years on the “winning prediction” is obvious! Yes, nominal growth remained sub-par all the way through. This spate of bad news for forward guidance should not be surprising. For it is like trying to navigate a ship by focusing on the expected path of its rudder. No ship captain can credibly commit to a certain rudder path across the ocean because water currents and wind conditions are bound to change. A captain, however, can credibly commit to a destination and do whatever it takes to get there. In this case, the rudder is not the focus and is adjusted as needed to offset the unexpected changes in current and wind conditions so that the ship stays on course. Similarly, a central bank cannot credibly commit to a certain path for its policy rate if it wants to hit its destination. For most central banks that means full employment and stable inflation. Forward guidance commits the central bank to a path of low policy rates beyond this destination in order to get more stimulus today. That is akin to a captain saying it will keep his rudder and ship on a certain path even after they make it across the ocean. No one would take that claim seriously. The ship has to stop when it hits the shore. Likewise, a central bank cannot commit to a flexible inflation target and at the same time credibly commit to a path of policy rates that would violate this monetary regime. This is why markets are now challenging the FOMC’s forward guidance on interest rates. They see an economic recovery that will force the Fed to raise interest rates faster than the FOMC [or the BoE for that matter] says it will. In my remarks, I will discuss where such guidance can be effective and when it may be warranted. My main message is while transparency is critical to well-functioning capital markets and effective monetary policy, forward guidance of policy is best used sparingly in normal times. In extraordinary times, however, conditional guidance can be used to resolve time inconsistencies and achieve a better path for the economy. From our perspective, thresholds exhaust the guidance options available to a central bank operating under flexible inflation targeting. If yet further stimulus were required, the policy framework itself would likely have to be changed. For example, adopting a nominal GDP (NGDP)-level target could in many respects be more powerful than employing thresholds under flexible inflation targeting. This is because doing so would add “history dependence” to monetary policy. Under NGDP targeting, bygones are not bygones and the central bank is compelled to make up for past misses on the path of nominal GDP. Yes, I know Carney does not decide by himself. He has to convince a committee of ‘savants’ (as does Bernanke, and shortly Yellen). So it appears that strong leadership (and salesmanship) qualities should be an additional requirement for central bank chiefs.